Bid rigging involves groups of firms conspiring to raise prices or lower the quality of the goods or services offered in public tenders. Although illegal, the anti-competitive practice is widely applied and continues to cost governments and taxpayers billions of dollars every year across the world. The OECD Guidelines for Fighting Bid Rigging in Public Procurement aim to make bid rigging more difficult for contractors and help government officials identify suspicious bidding. IMSS is the largest social-security system in Mexico. It is also the second largest public procurer and by far the country’s largest public buyer of health products. In 2011, the OECD released a first report makimg more than 20 recommendations to IMSS on how to improve procurement procedures to avoid collusion among suppliers. Five years later, in 2016, IMSS invited the OECD to assess the status and implementation of the 2011 recommendations and to analyse their impact on procurement outcomes. After a first report issued about CFE's procurement system in 2015, CFE has once again asked the OECD to analyse if its procurement regime is aligned with the recommendations of the 2015 CFE Report. Mexico's main electricity company, the Comisión Federal de Electricidad (CFE) is the second largest public entity in terms of procurement budget, with over 300 purchasing units throughout the country and a procurement budget which represents almost 20% of all Federal procurement. In 2013, CFE thus asked the OECD and the Mexican Competition Authority (COFECE) to review its procurement practices in light of the 2012 OECD Recommendation and Guidelines for Fighting Bid Rigging in Public Procurement. The resulting report includes an analysis of CFE’s practices, laws and regulations and provides several recommendations on how to enhance procurement procedures. The report was released on 7 January 2015 at a launch ceremony attended by OECD Secretary-General Angel Gurría (transcript of speech in Spanish). The State’s Employees’ Social Security and Social Services Institute (ISSSTE) is the second largest Mexican social service agency in terms of the annual volume of goods and services purchased and the fifth largest federal procurement group. In order to actively promote genuine competition in the purchasing of goods and services and to continue its fight against bid rigging in public procurement, ISSSTE signed an agreement with the OECD in June 2012. Under this agreement, the OECD committed to provide training to ISSSTE procurement officials and to submit an analytical report on issues relating to bid rigging and effective competitive procurement. The ISSSTE report includes an analysis of ISSSTE’s practices, laws and regulations and provides several recommendations on how to enhance procurement procedures. The report was released on 14 November 2013 at a launch ceremony attended by OECD Secretary-General Angel Gurría (transcript of speech in Spanish). The State of Mexico (Gobierno del Estado de México, GEM) is the largest of Mexico’s 31 states in terms of the annual volume of goods and services purchased. It spends approximately 23 percent of its annual budget on public procurement. After his election in September 2011, Eruviel Avila Villegas (Governor of the State of Mexico) decided to seek the OECD’s assistance to improve the State’s procurement practices and to step up its fight against bid rigging. 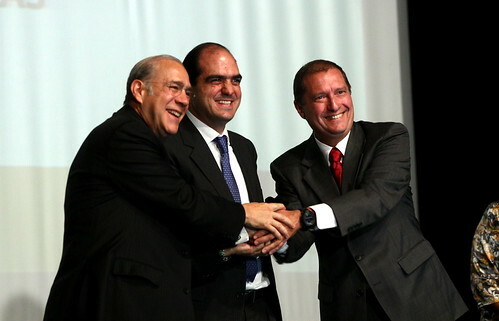 An agreement with the OECD and the CFC was signed in October 2011. As a result of this agreement, the OECD drafted a report on Procurement Legislation, Regulations, and Practices in the State of Mexico with policy recommendations. This report was presented officially on 30 October 2012 during John Davies’ visit to Mexico to meet Governor Avila Villegas and other top level Mexican officials. Mexico’s Social Security Department spends around 2.5 billion US dollars annually on pharmaceuticals and other goods and services. Stepping up their fight against bid rigging by companies tendering for government contracts, the Mexican Competition Authority and the Mexican Social Security Institute (IMSS) signed a co-operation agreement with the OECD in January 2011 to implement the OECD guidelines. Since then, the OECD and the Mexican Competition Authority have been working with the IMSS to improve rules and procedures, and to train procurement officers.